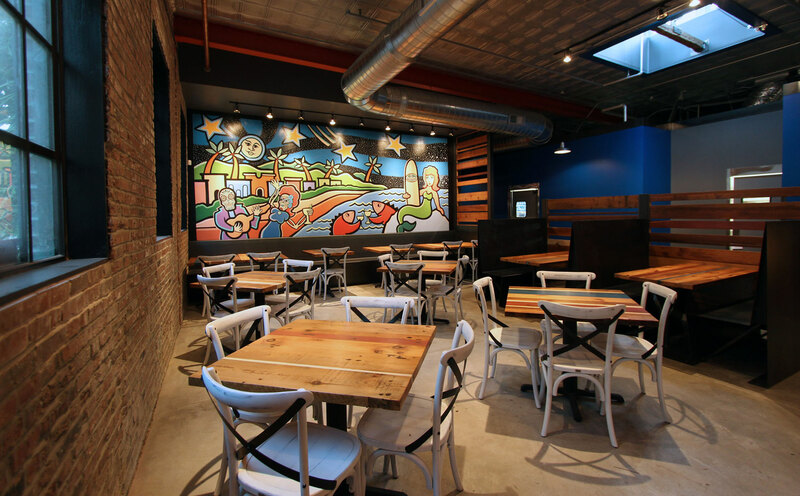 Not a year after designing the inaugural Mission Taco Joint on Delmar Boulevard, Adam and Jason Tilford challenged SPACE to create the same festive, casual atmosphere in their newest location in Soulard. Led by Tom Niemeier, the designers worked to preserve and enhance the former warehouse’s original architectural features, including exposed brick, tin ceiling, skylights, and overhead doors in what would be the dining room. To create more intimate, cozy spaces within the large restaurant, the team designed and built a canopy from reclaimed 150-year-old wood around the centrally-located bar. This separated different groups of diners while maintaining the vibrant flow of energy in the restaurant. The team selected different chairs for the small seating area next to the front garage door to create another unique sense of place within the bustling restaurant. View of the steel bar, through the reclaimed wood canopy. This view shows just how large the space is. The wall-mounted lights were designed to look like street lights. The front dining area. When the weather’s nice, the staff opens the garage door to give the restaurant an open-air feel. Mission Taco’s “mission bell” is mounted up in the skylight. An overall shot of the space from the front garage door.